Clara Barton. Clara Barton Civil War Nurse. was born Clarissa Harlowe Barton in North Oxford, Mass. on Christmas Day December 25, 1821 and died in Glen Echo, Md. on April 12, 1912. Not enough praise can be given to Clara Barton, who during her lifetime accomplished so much. Clara was a pioneer teacher, clerk, battlefield nurse and general humantarian whose father had advised her before his death. He told Clara it was her Christian duty to aid the soldiers. Clara would organize supplies from the Ladies Aid societies and get them to the battle sites. In 1864 Clara was appointed by Union General Benjamin Butler as the “lady in charge” of the hospitals that were with the the Army of the James. Included in her more harrowing experiences was the time where bullet came so close, that it tore through the sleeve of her dress without striking her and killed the soldier whom she was holding. 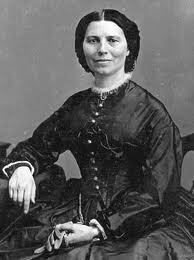 Clara Barton became known as the “Angel of the Battlefield. Clara Barton would become the Founder and First President of the American Red Cross, the same organization that helps the needy and disaster victims that we know today. September 17, 1862. Clarissa Harlowe Barton who we know today as Clara Barton battlefield nurse is about to witness the The Battle of Antietam as she travels in her wagon to the area of the two armies in Maryland around Sharpsburg. LIke crouching beasts, the two armies face each other. She arrives in the predawn to see the fires of both armies burning. Soon in the first light, she will hear the musketry and artillery open up and this terrible and bloody battle begin. Clara had wagoned with an associate the 80 miles to the battlefield before the battle and will be attending to hundreds of Union wounded soldiers as well a some wounded Confederates. Planning ahead as Clara has already been at battlefields such as Cedar Mountain and Second Bull Run, Clara has a wagon load of medical supplies she bring as well as equipment such as lanterns (when the doctors ran out of candles) will save countless lives. An item such as bandages was in such short supply that the medics were tying the wounds with corn husks. Chloroform and liquor was gone within hours..Clara continuing to assist the doctors into the night with battlefield surgeries. Clara Barton will continue her work with the wounded throughout the war..her metal having now being tested at Sharpsburg, Maryland, a witness to The Battle of Antietam ..during the bloodiest day in the Civil War. Clara Barton‘s work will expand exponentially..into our own American Red Cross..the same we know today. Thank you Clara.